We’d love your help. Let us know what’s wrong with this preview of Two Speeches by Malcolm X by Malcolm X. 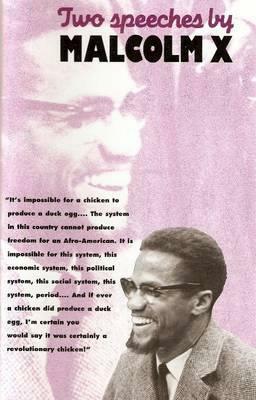 "It's impossible for a chicken to produce a duck egg.... The system in this country cannot produce freedom for an Afro-American. "Speeches and interviews from the last year of Malcolm's life. To ask other readers questions about Two Speeches by Malcolm X, please sign up. After leaving the Nation of Islam in 1964, he made the pilgrimage, the Hajj, to Mecca and became a Sunni Muslim. He also founded the Muslim Mosque, Inc. and the Organization of Afro-American Unity. Less than a year later, he was assassinated in Wash Malcolm X (born Malcolm Little), also known as El-Hajj Malik El-Shabazz, was an American Black Muslim minister and a spokesman for the Nation of Islam.